The internet is a vast and beautiful entity that allows unprecedented access to information, the likes of which we have never seen before. Never before has one had as much access to knowledge as today, and that’s thanks to the internet. Not only is the internet a giant repository of information, it is also a vast marketplace. Never before has the world’s market been so easily accessible to individuals and businesses all over the world. The internet has changed the way we do business forever. These days, e-commerce has become as common place as watching tv. It’s something that many people do every single day, and probably couldn’t imagine their lives without. There are lots of people that started out with small local business who have used e-commerce to boost sales and make up a large part of their income. It’s exciting to see that this entirely new system of doing business only came into existence a few decades ago. It’s amazing to see how far it’s come, and even more exciting to speculate how it will advance in the future. In the very, very beginning, there was the development of the Electronic Data Interchange (EDI). The EDI was very convenient as it replaced the more traditional forms of document exchange such as mailing and faxing. This system was used mainly by trading partners who utilised it to transfer orders, invoices and pretty much any other business transaction. The data format that was used, met the ANSI ASC X12, which was the main set of standards in America. When an order is sent, it was then examined by a Value Added Network, and then proceeded to be processed by the recipient’s system. The EDI was a great tool in its time. It allowed quick and easy transfer of data, without the need for any human intervention. The man credited with inventing the earliest form of ecommerce is Michael Aldrich. He was an English inventor and entrepreneur. According to the stories, he was one day out with his wife and he was complaining about having to make a long trip to the supermarket. He was then struck with a sudden wave of inspiration. He had the idea of hooking up television to your supermarket to get them to deliver your groceries. In 1979, he connected his television to a computer that was designed for processing transactions. He then coined the term “teleshopping”, which is the earliest form of ecommerce that we know today. The internet as we know it today, was invented by a man called Tim Berners Lee. He was formerly an employee of CERN. He and his friend Robert Caillau, created a proposal to build a “hypertext project” called “WorldWideWeb” in 1990. Later that year, Lee used his NeXT computer (product of Steve Jobs after being ousted from apple) and created the very first web server and hand coded the first browser. Soon after, he went on to make the internet publicly available on August 6, 1991. He went on further to integrate hypertext in the internet and proceeded to develop the URL, HTML and HTTP. Initially, there was a ban on ecommerce. People were not allowed to engage in commercial use of the internet. Eventually, the National Science Foundation lifted the ban in 1991. Since then, the internet and ecommerce has been experiencing exponential growth. It wasn’t until 1995 that the NSF began charging a fee for registering domain names. There were then 120,000 registered domain names. Within 3 years, however, that number grew to over 2 million. At that point in time, the NSF no longer controlled the internet. For hundreds of years the marketplace has been growing more complex and more confusing for consumers to navigate. Published in 1992, long before the Internet became a household word. Future Shop argued that new information technologies, combined with innovative public policies, could help consumers overcome that confusion. A prescient manifesto of the coming revolution in e-commerce, Future Shop’s vision of consumer empowerment still resonates today. From the early days of the internet, there were many concerns regarding online shopping. In 1994, Netscape developed Secure Socket Layers (SSL) which was a new security protocol that protected sensitive information transferred over the web. Browsers had the ability to detect if a site had an SSL certificate, which was a major indicator as to the trustworthiness of a site. Nowadays, the SSL encryption is one of the most powerful security protocols of the internet. Recently, it was recently exposed to the Heartbleed exploit, which made waves in the web industry. It just goes to show how important SSL was in the online community. The dot-com bubble was one of the darkest times in internet history. It was giant bubble in the stock market that was created by eager investors looking to cash in on the new “dot com” companies. They were drawn in by the hype and the novelty which caused them to ignore common sense business strategies. Eventually, the bubble popped in 2001. This resulted in many people going bankrupt, trillions of dollars lost and some very valuable lessons learned. The bubble was so bad, that it triggered a small economic recession in the early 2000’s. There were numerous factors that contributed to the bubble, the period of speculation and investment in internet firms between the years 1995 and 2001. In 1995, with the increase in popularity of internet users, many firms saw the increase in users as potential customers and increased revenue. As a result of this, many internet start-ups were conceptualized in the late 1990’s. They came to be known as “dot coms” because of the popular TLD “.com” which followed their names. The entire dot com industry was well known for their rash business practices which were based on “potential” rather than actual revenue. The policies were mainly growth over profit, which was the incorrect assumption that if they increased their customer base, that their profits would also rise. Many companies spent millions of dollars attempting to dominate the market for a specific product or need. Very few companies survived and thrived after the infamous dot com bubble, these included e-commerce giants such as eBay and Amazon. Today Amazon and Ebay are both amongst the most successful companies on the Internet! Only a few weeks after selling his first ever book online, the founder of Amazon, Jeff Bezos, was selling books to every state in the U.S and over 40 other countries. The simplified process of order fulfilment and shipping enabled him to order books directly from the publishers. Another eCommerce giant, eBay, saw amazing growth as well. They allowed pretty much anyone to buy and sell online. In just a couple of years the website became a household name. It revolutionised ecommerce and was turning over hundreds of millions of dollars each year. 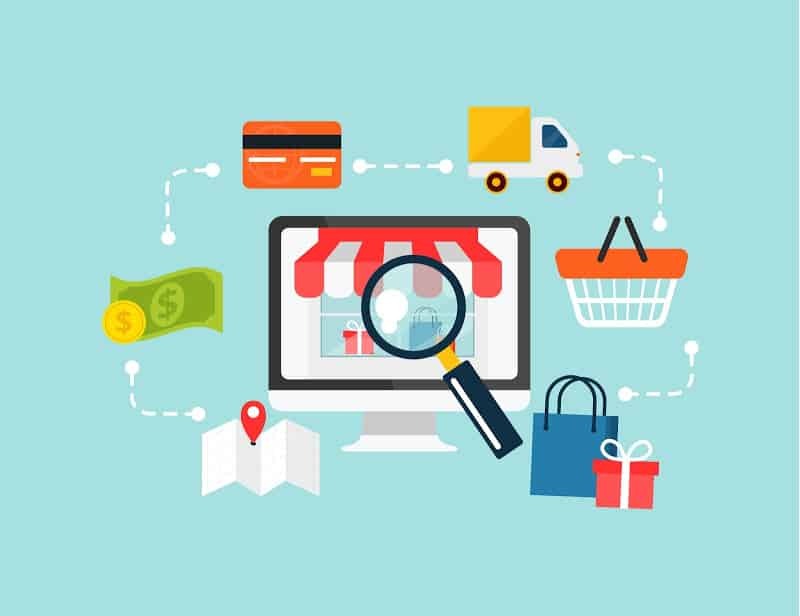 From its humble beginning in 1995 modern Ecommerce has become the fastest growing area of business, showing continued growth year after year. Technology has advanced further making it so much more accessible to people from all walks of life, and entire industries have been built around Ecommerce which are today, the who’s who of the business world. These days, practically anything can be bought or sourced online. From your dinner to, clothes to a private jet. Over 60% of adults have purchased stuff online and this figure will only increase in the coming years. This shows that people love shopping online. The convenience of not having to leave your home, to the transparency of user reviews make it irresistible to today’s youth. One of the greatest lures of ecommerce is the fact that anyone with drive and motivation can succeed. The potential for growth and scalability is unprecedented. The advantages are practically endless. There has been another surge in tech companies recently, following the increased popularity of mobile phone and web apps, as well as social media. These tech startups are often the epitome of new-age business. Seemingly small companies are worth billions of dollars and in many cases the employees don’t even live in the same city, or even the same country. These companies are being sold for millions of dollars with the help of website brokers. This is a career solely based on the buying and selling of web properties. Many speculators are worried that this may be the beginning of another bubble. But silicon valley investors are relentless and for the time being, have been seeing a substantial ROI. In conclusion, the way we do business has been changed substantially ever since the inception of the internet. From eCommerce giants like Amazon and eBay making it easier to get anything you want online, to regular mom-and-pop stores extending their reach globally, to bloggers that earn based on their ability to engage an audience, to multi-billion dollar tech startups. The world is changing rapidly and more opportunities are being created. Many people no longer have to depend on their local economy to find work, start a business and earn money.